When game journalists bicker over the injustice of "exclusive" screenshots, who wins? 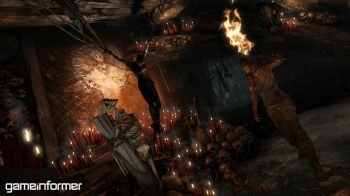 Here's the story so far: PC gaming-centric blog Rock Paper Shotgun (RPS) posted screenshots from the upcoming Tomb Raider reboot that were exclusive to Game Informer. The post in question, written by John Walker, was essentially a rant against the idea that one website "owns" an image from a game but he bragged about cropping out the watermark while simultaneously linking back to Game Informer. After RPS reader Dean Bowes posted a link on Twitter quoting some of Walker's rant, Andrew Reiner, Executive Editor of Game Informer responded with force. "Please remove those images or we'll seek legal action," his post read. After presumably realizing that he was threatening legal action against a reader and not an actual representative of RPS, Reiner contacted RPS privately and John Walker pulled the images and replaced them with pictures from the freely distributed WikiCommons while further railing against the "idiocy" of the current system of publishers doling out such exclusive assets. "Games aren't a special secret, they're a commercial product," wrote Walker in the original post. "So why on Earth would you then attempt to inhibit that information by distributing it through one (albeit splendid) source, who can watermark everything and then justifiably get narked off when other sites/mags nick all their information uncredited." I contacted Walker and he had some more choice words to say on the subject. "It troubles me how deeply embedded the ridiculous system of online exclusives has become," he wrote me in an email. "It's like trying to claim a section of the sea is yours, and then complaining when your bits of water start sloshing outside of it. Or heaven forbid someone else dare to swim in your claimed bit of ocean." Walker realizes that it's a bad thing to take images without linking the source, but he points out that his post was one big advertisement for Game Informer. "We all operate within certain unofficially agreed acts of courtesy. If one site is the only place to have some information, or some screenshots, you credit them and you link back to them. It's a douchy thing to take all their stuff and post it as your own. But it's perfectly reasonable to use it to illustrate a piece that links back to the source," Walker said. "But really, the idiocy of publishers giving out adverts for their games like precious, secret jewels has got to end. It's self-defeating, and it's deeply tedious for the readers of every other site/mag in the world who want to know about a game they may want to play." Personally, I think that both parties were wrong and right at the same time. I agree with Walker that the system is screwed, but writing about that while simultaneously stealing someone's copyrighted material is not only illegal but also a huge professional discourtesy. I don't know what deal Game Informer had in place with Eidos for those Tomb Raider shots but they are "paying" for them somehow and to rip them off was just wrong. On the other hand, Reiner wasn't exactly being a PR genius for publicly demanding that the pictures be removed in a forum as public and transparent as Twitter. It all could have been handled behind the scenes and not doing so cost him and his publication much of the prestige it would have gained from owning the exclusive in the first place. While the internet is all atwitter with the current controversy, it will surely die down soon. But I'm sure that this isn't the last that we'll hear about the seedy underbelly of the tenuous publisher-developer-journalist relationship.